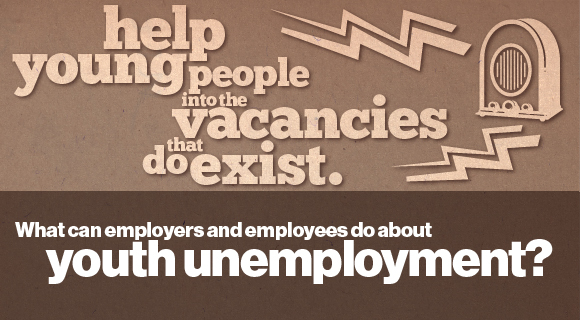 What can employers and employees do about youth unemployment? The latest unemployment figures published in October showed a welcome fall in the number of people out of work, with youth unemployment retreating below the 1 million mark, falling by 62,000. While that points to a step in the right direction, it remains the case that around one in five 16 to 24-year-olds are jobless. Young people, it seems, are still bearing the brunt of the economic slowdown. But what is the reality for young jobseekers and employers? Both face a daunting challenge with the labour market at its toughest for decades. In a bid to understand more about the reality of job-searching, the JRF, with the Universities of York and Warwick, tested whether applicants from more deprived areas were being ignored because of postcode discrimination. On that front, the report findings that came back were heartening. Despite public perceptions that employers discriminate against residents from neighbourhoods with poor reputations, the study found no significant difference in response rates for applicants from areas with poor reputations versus those with ‘bland’ reputations. The study interviewed employers and young jobseekers, analysed vacancy data and experimentally sent in around two thousand job applications by relatively well-qualified, fictional candidates to 667 real jobs (such as sales assistants, cleaners, office administrators and kitchen hands). These were spread across three different labour market areas in Britain (one strong, one weak, one in-between). By delving into the world of young jobseekers, we discovered some major issues for both would-be workers and employers. Only 24 per cent of vacancies found offered full-time, daytime work. Over half of vacancies were minimum wage and 78 per cent paid under £7 an hour, making it less likely that jobseekers would travel far to do them. Employers preferred local candidates for such jobs. So although jobseekers need to search beyond their immediate neighbourhood, policies demanding wider geographical searches will not necessarily get more people into work and in fact just increases competition. Intense competition meant that some employers advertise vacancies online and close them as soon as they have sufficient applicants to select from. Not all jobseekers are aware how quickly they need to respond to vacancies, and those without internet access at home are at a disadvantage. Applications sent one to three days after jobs were advertised were twice as likely to receive positive responses as those sent after a week. Over two-thirds of applications (69%) received no response at all to their application. Even in the stronger job market, there were 24 unemployed people chasing each retail vacancy available through Jobcentre Plus, and 50 each office vacancy. In the weaker job market area, the figures were 66 and 44 respectively. Clearly this points to problems with labour demand in the economy. But there are things that can be done to help jobless young people into the vacancies that do exist. To increase their chances, jobseekers need sound intelligence about their local labour market and employer recruitment practices, supported by Jobcentre Plus advisors. However, recruitment methods varied considerably between job type, area and employer. Some notified vacancies to Jobcentre Plus; some used their own or private websites. Most used the internet in some way. Jobseekers must find out as much as possible about employer recruitment behaviour, where vacancies are advertised, and how jobs are filled in their local areas. Better qualifications, better CVs and an increased speed and volume of job applications will enhance the position of jobseekers. Jobcentres and employers could help jobseekers by taking vacancies off their own websites as soon as they are filled. Lack of response to applications and feedback from employers sapped the confidence of many jobseekers, allowing ill-targeted applications to be repeated. Employers should provide some kind of feedback. These recommendations are in tune with those published by UKCES in July as part of their Youth employment challenge report, where employers are encouraged to adopt youth policies. The JRF research also points to deep problems in the understanding of jobseekers of how employers are recruiting in low-paid labour markets; and vice versa. The issues now are the way that employers seek out or treat young people within their business and especially the unintended consequences of their recruitment practices on the morale and effectiveness of those looking for work. I have been working with a range of partners to look into innovative ways that can tackle youth unemployment and create a better youth service. I've shared some of the ideas that have been generated from my research with influential partners such as UKCES and I would welcome the opportunity to discuss these further with JRF and decision makers from within UKCES and NCVYS. In the age of the Social Entrepreneur , this is a cost-effective opportunity to support change and benefit young people. Due to the current economics and macro low growth - there are not enough jobs out there and what is out there is low paid or part time, which can cause unrest rather than job satisfaction to many. More creative methods are required to address the current situation and one where the individual can at least have a guaranteed minimum weekly return. If the return is not perceived as sufficient then the effort to go and get a job will not be there and a cycle of not working or making the effort will continue. This report is very poor and indeed shameful. This current situation relates to a continued increase in unemployment totals, Tables and figures released show higher jobless rates, especially for the youths of UK. The young are bearing the brunt of the global economical downturn with the lack of job opportunities for youngsters.